Separation anxiety is one of the most common problems dogs develop. It's a psychological disorder, defined as a state of intense panic brought on by the dog's separation from her owner. 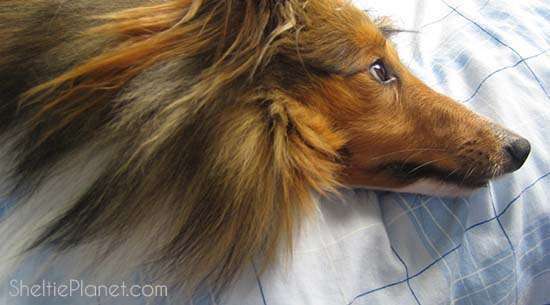 Nervous Shelties can go particularly crazy. Separation anxiety is a real problem for pet dogs. When you leave for work in the morning, your dog may be plunged into a state of nervous anxiety which intensifies rapidly without your return. Why is this? Dogs are social animals. They need an abundance of human company and social interaction to feel happy. No dog likes to be left alone for long stretches of time, but some dogs suffer a lot more than others because of their nervous psychological disposition. 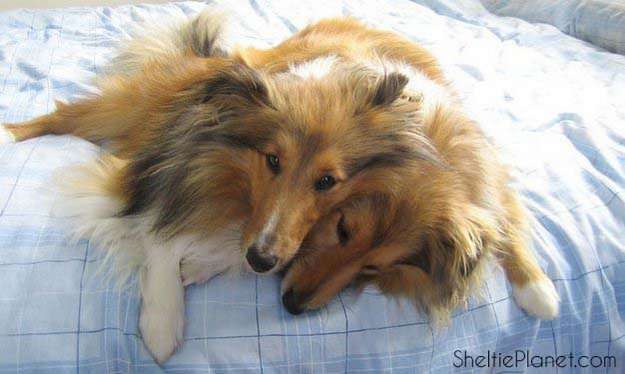 Shelties are particularly prone to developing this problem because they were bred to be highly sensitive watchdogs as well as affectionate companion animals. They hate it when you're not around! Some dog breeds are genetically predisposed towards anxiety and insecurity, which is something you should consider before buying a puppy, particularly if you're going to be absent for long stretches of time. The most susceptible breeds include Shetland Sheepdogs, Weimaraners, Springer Spaniels and German Shepherds. A large proportion of dogs from rescue shelters develop separation anxiety. Most of them have undergone significant trauma in their lives - at the very least they've been abandoned by their previous owners. And so they naturally have little faith that their new-found owner isn't going to pull the same trick and leave forever. Dogs that are separated too early from their mothers and siblings are especially prone to separation anxiety. Pet store puppies are prime examples: they're usually taken from their mothers well before the earliest possible age (which is 7 weeks) and confined to a small glass box in the pet store for anywhere between a few weeks to two months. This early weaning, coupled with a significant lack of exercise and affection in the pet store, is psychologically traumatic for a dog. Sadly, neglect is the number one cause of separation anxiety for dogs. If you're absent much more than you're present in your dog's life, then separation anxiety is pretty much inevitable. Your dog needs your companionship, affection, and attention in order to be happy and content. Your dog will usually learn to tell when you're about to leave (she'll hear keys jingling, or will see you putting on your outdoor clothes) and will become anxious. She may follow you from room to room, whining, trembling, and crying . Some dogs even become aggressive, in an attempt to stop their owners from leaving. When you've left, the anxious behavior worsens, peaking within half an hour. She may bark incessantly, scratch at windows and doors (an attempt to escape from confinement and reunite herself with you), chew inappropriate items, even urinate and defecate inside the house. In extreme cases, she might self-mutilate by licking or chewing her skin until it's raw, pull out her fur, or engage in obsessive-compulsive behaviors like spinning and tail-chasing. This extended greeting is a source of some misunderstanding: without realizing that it signifies separation anxiety, some owners actually encourage their dog to get more and more worked up upon their return. They do this by fueling the dog's excitement, encouraging her to leap around, and paying her protracted attention. While this is very fun for you, it's doing even more damage to a dog suffering from separation anxiety. You're validating her belief that your return is the high point of the day. So she's as happy as Larry when you return - but when it's time for you to leave again, her happiness is under threat, and so she gets even more anxious when you walk out the door. DO exercise the heck out of her. The longer you expect to be away, the more exercise she should get before you leave. For example, if you're leaving for work in the morning, she'll probably be by herself for at least four hours; and, if you've got a dog-walker to take her out mid-day instead of coming back yourself, she won't see you - the person she really cares about - for at least nine hours. So she needs a good, vigorous walk for a bare minimum of 20 minutes before you walk out that door. More than that is obviously better! DO distract her from her boredom, loneliness and anxiety. Give her an attractive alternative to pining, pacing and whining. Many dogs love to chew a tasty treat - so get a couple of marrowbones from the butcher, bake them in the oven for 20 minutes (so they go nice and hard and crunchy and she can't smear marrow all over your furniture), slice them up into chunks of a few inches long, and give her one a few minutes before you leave. It'll keep her happy and occupied, and distract her from your departure. DO put the radio on to a soothing station. Classical music is good - or try any station featuring lots of talk shows. Keep the volume quite low, however. It'll calm her down and give her the feeling that she's got company. DO supply her with a view. Let her climb on the couch by the window. If she can see the world going by, that's the next best thing to being out and about in it. DO acclimatize her to your leaving. Taking things nice and slowly, simply practice getting ready to go (without actually leaving). Jingle your keys about, put on your shoes, and open the door. Then sit back down and don't go anywhere. Do this until she's not reacting with anxiety any more. When there's no reaction, give her a treat and lavish praise for being so brave. Next, practice actually walking out the door (and returning immediately), again doing this until there's no reaction. Gradually work up until you're able to leave the house with no signs of stress from her at all. DO NOT act overtly sympathetic when she's crying. Although it sounds cold-hearted, trying to soothe and comfort your dog by patting her and cooing over her is actually one of the worst things you can do. It essentially validates her concern, because now you are genuinely concerned too, so she figures there must be something to be afraid of! Offer calmness and confidence and make sure she can't tell that you feel sorry for her. Never say, "good girl" when she's upset.